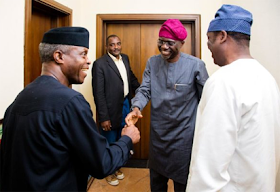 Vice President Yemi Osinbajo has not endorsed Babajide Sanwo-Olu in the Lagos All Progressives Congress governorate scheduled for Monday. Contrary to the impressions created by a photo that shows Vice President with Sanwo-Olu, Osinbajo is neutral in the election. He only came to plead with the party leaders to allow a level playing field for the two contestants, including the incumbent Akinwunmi Ambode. According to a statement by Osinbajo's office, Osinbajo attended a meeting of the Lagos State General Advisory Council, GAC, where he had been invited by the elders on the council. Before the meeting, the Vice President who had been in Lagos to participate in the Presidential primaries in the state had met with Governors Akin Ambode and APC National Leader Ashiwaju Ahmed Bola Tinubu. At the GAC meeting, Prof Osinbajo, who believed to be in favor of a second term bid for Ambode, conveyed the view of the Buhari presidency that there should be a level playing field in the overall conduct of the primaries. Informed sources at the meeting said the purpose of VP's attendance at the GAC was to report on a previous meeting held between him and Gov Aregbesola on how to resolve some of the outstanding issues surrounding second-term bidor's Governor Ambode and its fallouts. "It was while he came out of the meeting that Mr. Sanwo-Olu and Mr. Hamzat took advantage of VP's presence to take the photos now falsely paraded as evidence of endorsement." The VP did not endorse the candidates, they only took advantage of his presence, "and last night's source confirmed the meeting.